Dr. Andrews became an orthodontist for reasons that many of us at Rogers & Andrews Orthodontics can resonate with — we wanted to help people. Not only did most of us know we wanted to help others from a young age, but we knew we wanted to help people feel good about themselves. Dr. Andrews, a Board Certified Orthodontist, knew very early in life that he wanted to improve the smiles of his patients by giving them the self-confidence they deserve. 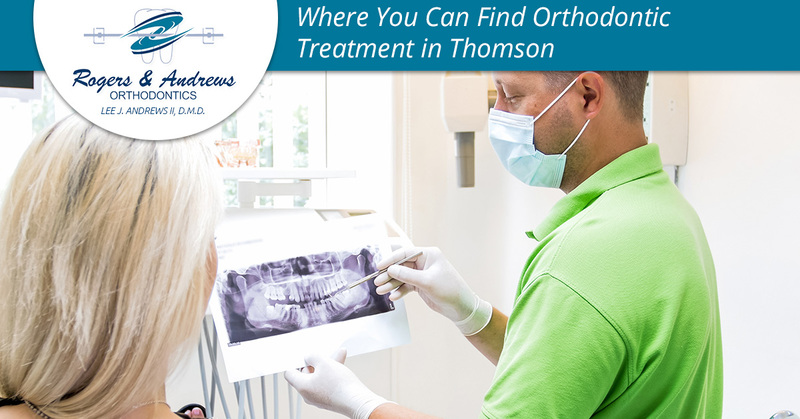 If you’ve been looking for a Thomson orthodontist, you might be like many of us and have only done a bit of searching, with hardly any of it being able to be described as “serious investigation.” Maybe you took your phone out and typed in “best orthodontist near me,” or even “top Thomson orthodontist.” Perhaps you took it a step further and took a look at a few of the online reputations of the most popular orthodontists you were able to find. It’s also possible that you didn’t do an ounce of research on your own, but simply had your dentist’s preferred orthodontist reach out to you to schedule an appointment. No matter how exactly you went about doing it, the fact of the matter is that you have made your way to Rogers & Andrews Orthodontics. This tells us we are among the local “orthodontists near me” that you are considering. We wanted to take the opportunity in today’s post to describe the orthodontic treatments we offer, but not before we welcome you by informing you what sets us apart as a Thomson orthodontic treatment center. Keep on reading to learn more about why you should choose Rogers & Andrews Orthodontics if you live in Thomson, Augusta, and the CSRA! There are distinct qualities we possess which set us apart as an orthodontic clinic in Augusta and Thomson. We have a culture of compassionate excellence, meaning we believe in providing our patients with the most contemporary, state-of-the-art orthodontic techniques that yield overwhelmingly positive results for our patients. Ultimately, it’s about completing steps to help you achieve the healthiest, most radiant smile you’ve ever had. We offer skilled, caring, and experienced orthodontic treatment. We’ve treated well over 15,000 patients and over 100 dental family members in Augusta, Thomson, and the surrounding region! There are many paths to straight, healthy teeth, just as there are plenty of great orthodontists our there. We believe that our dedication to our patients sets us apart from many of them. Our compassionate and affordable care will leave you thrilled with the work you’ve received. Give us a call to schedule your first appointment today!